The final installment of this Seventh Doctor is a bit of an odd one. Following the monumental and emotionally laden ‘Project: Destiny’ and ‘A Death in the Family,’ having the third and final story be a standalone adventure creates a rather disjointed experience when taken as a whole. Individually, however, writer Marty Ross channels the eminent works of HP Lovecraft as he explores the internal tragedies of the life of CP Doveday. Lovecraft, of course, flourished with suspense, relying on fragments of description to carry his various horrors and to terrify his audience. This approach could have worked quite well in the audio medium as well, but while the tall and loud descriptions of the titular lurkers are fragmentary at best, the creatures themselves only serve to instill terror in the people directly in their presence as they trudge and roar. This is one case where further description could have helped immensely. Even as Doveday himself sometimes transfigures between alien and human forms, his yelling in the alien language adds little drama or tension. Giving Doveday’s Shuddersome Tales a foundation in reality is a clever concept that blurs the lines of fiction and nonfiction, but that regrettably means that there are several overused horror mainstays in play throughout this tale. This also means that there are several scenes featuring screaming and yelling, again not always with a clear picture of what is actually happening. The sound design and score, at least, are as evocative as ever, lending an air of tense credulity to the bizarre events. While the script does unfortunately rely on clunky descriptive dialogue, a plague of early Big Finish scripts but an issue thought long since resolved, the performances are generally strong. Sylvester McCoy is surprisingly underused as the Doctor commences an innocuous investigation, but Philip Olivier is superb at portraying Hex as a man who simply can’t take more of the unending stress, even if the choice to have him once more think the Doctor is dead is a strange one. Sophie Aldred also does well at showing the more compassionate side of Ace as she develops a subtle relationship with Doveday, but the more emotional scenes between the two again fall a bit flat. Michael Brandon as Doveday and Stuart Milligan as the chillingly villainous Emerson Whytecrag both offer intriguing performances that fit in with the offbeat tone of the play even if they are sometimes a bit exaggerated. 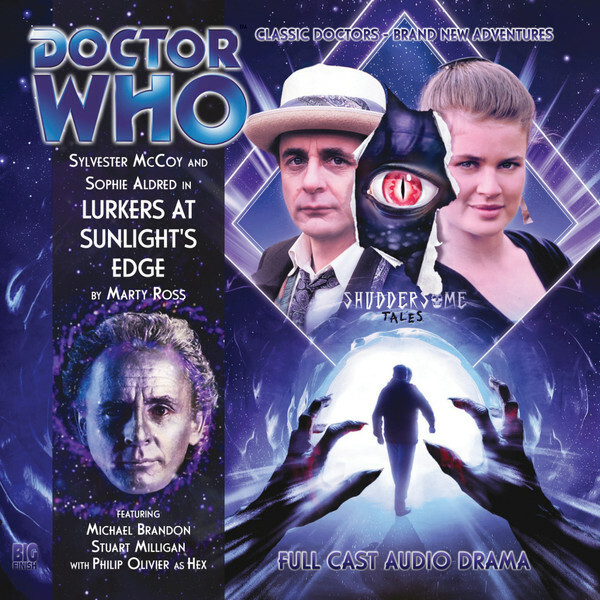 Even as a standalone release, ‘Lurkers at Sunlight’s Edge’ is certainly not a highlight of Big Finish’s ever-increasing catalogue. Aside from a quick mention of the Doctor’s recent brush with death and the colour of the TARDIS, this release could be slotted practically anywhere into the Ace and Hex era, and it’s unfortunate that it had to follow the stunning ‘A Death in the Family’ to leave a much more muted and formulaic taste in the audience’s mouth at the end of this string of three adventures. While slotting it before the previous two releases certainly would have heaped fewer expectations on it, the fundamental flaws of too much clunky description in the dialogue and not enough description of what is actually happening do little to inspire and sort of meaningful impression.